Django – Create custom django-admin command | Eureka! Not only this built-in commands, we can write our own command too. 2. Move to the project directory and create a new app. # Create a new app and give a proper name, in this example scheduler. 3. Move to the scheduler app folder and create some files as highlighted below. The __init__.py are just empty files. 5. Include the scheduler app in custom_command/settings.py. 6. Move to the project root and generate the db.sqlite3. 8. Run the hello_world command. The custom command could also take input parameters as well as different options. For more details, please refer to the official documentation below. Pingback: Django – Schedule django-admin command using django-chronograph | Eureka! 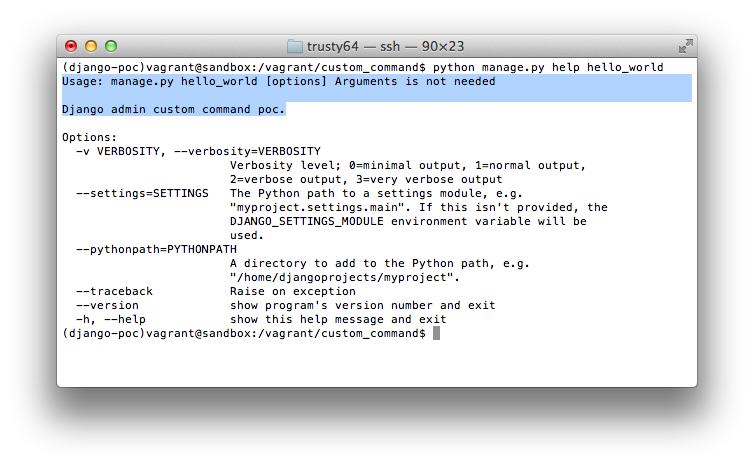 Pingback: Python – cx_Oracle throws missing libclntsh.so.11.1 when executed by django-chronograph | Eureka!